Loggerhead turtles take almost half a century to reach maturity, say scientists. 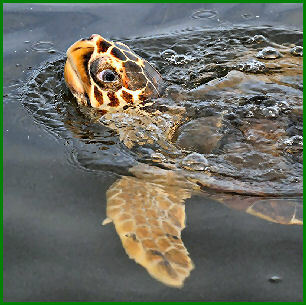 A female turtle, the researchers report in the journal Functional Ecology, will not start to lay eggs until she is 45. This estimate, based on examination of several decades of data on the turtles' growth, has implications for conservation efforts. It reveals how long it takes for turtles hatched at a protected nesting site to return to that site to breed. Prof Graeme Hays from the University of Swansea, one of the authors of the study, explained how reaching maturity so slowly meant that the turtle population was "less resilient" than previously thought. "The longer an animal takes to reach maturity, the more vulnerable the population is to [man-made] causes of mortality," said Prof Hays. This, he explained, was because there was a much higher chance of an individual animal being killed - for example, by being deliberately or accidentally caught in a fishing net - before it had been able to "replace itself" by breeding. It is, however, extremely difficult to follow the life cycle of a sea turtle. These long-lived marine reptiles are impossible track as they drift through thousands of kilometres of ocean, spending the vast majority of their time underwater. "You can't follow one individual throughout its life," Prof Hays explained. "So previous estimates of their age at maturity are all over the place - spanning from 10 years to 35 years. It was impossible to get some sort of consensus." To overcome this problem, the researcher and his colleagues embarked on a three-part data trawl. To estimate the growth rate of newly hatched turtles, the team examined measurements of hatchlings at a nesting site in Florida and compared these with the sizes of the same turtles when they had drifted across to the Azores islands in the middle of the North Atlantic. This journey - drifting several thousand kilometres on the currents - takes approximately 450 days. The scientists were able to see from the data they examined how much the turtles grew during that time. The team also used many hundreds of measurements made by scientists who had captured, marked and recaptured individual loggerhead turtles. Using these figures, they were able to chart the animals' growth rate. All of this data enabled the researchers to use the size of mature loggerhead turtle mothers - measured at several well-studied nesting sites - to estimate their ages. Bryan Wallace, science adviser for Conservation International's Sea Turtle Flagship Program, said that knowing how long it took turtles to grow up gave "a better idea of how long conservation efforts should be maintained on nesting beaches before we can expect to literally see the results". Dr Wallace told BBC Nature: "These estimates reinforce that animals like sea turtles take a very long time to recover from human-caused population declines. "So conservation efforts must be appropriately targeted to address the most important threats, and they must be maintained for decades to ensure success."